I'm sure everyone who knows Pokemon knows about Eevee. Voted the cutest by Pokemon fans, its eight different possible evolutions with different types and powers catch people's eye. So, imagine your Eevee is ready to evolve but still can't decide what to evolve in to. As its trainer, that responsibility is yours! 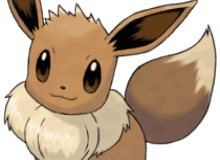 Take this quiz to find out which Eeveelution is best for you and your Eevee! Favorite Pokemon type? NOTE: only allows 8 answers per question. If your favorite one is not on one question, tap "other"
What is your Eevee's personality? Which animal do you like, out of these? Which is your ideal place to live? That amazing superpower you always wanted to have? Which type of colors do you like? How experienced as a Pokemon trainer are you?